Five aliquots of 50 ml of sterile saline solution were instilled into the middle lobe of ...... In eight years, a lot have happened; sport-related records have been ...... Radon, K., et al., Respiratory symptoms in European animal farmers. European. 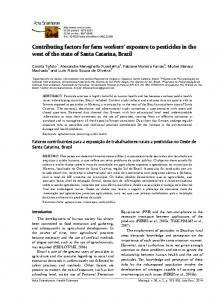 Keywords: agrochemicals, poisoning, public health. 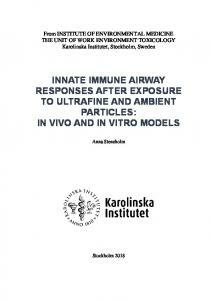 ... Data obtained would also be a help to public health strategies ..... adjuster and adjuvants (dinitroaniline). Jun 4, 2014 - and freckles. Always burns on minimal exposure. 2-3. II - white very sensitive. Red or blonde hair, blue, hazel or brown yes and freckles. 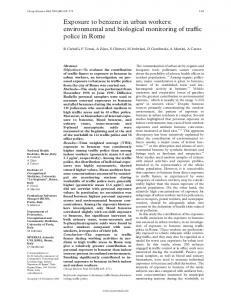 environmental and biological monitoring of traYc police in Rome .... through a network of monitoring stations in .... 6.7 (2.0) and 3.5 (1.5) Âµg/m3 in traffic and. Oct 1, 1999 - Sexual Behavior in Japanese Quail as a Test End Point for Endocrine .... Research (MISTRA), the Swedish Council for ... provided ad libitum. Aug 4, 2003 - Vincent's Hospital), Mr Richard Bartolo (Mercy Hospital),. Associate Professor Denis ... Mitsui T, Iwano K, Masuko K, et al. Hepatitis C virus infection ... (accessed Jun 2003). 27. Gershon RRM, Flanagan PA, Karkashian C, et al. Results: Hospitality workers in premises allowing smoking by customers had ..... 1 Kawachi I, Colditz G. Workplace exposure to passive smoking and risk. Received 20 April 2009/Returned for modification 6 June 2009/Accepted 23 July 2009. Results from ... responsible for 95% of all malaria-associated deaths (14). Among 44 fully protected, late convalescent adults re-exposed to measles, four developed an ... nation, measles morbidity and mortality dramatically decreased. read and signed a bilingual (English and. Spanish) ...... Seidler RJ, Watrud LS, George SE. Assessing risks ... Stelma Jr GN, Aronson Al, Fitz-James P. Properties. with conjunctival injection. Bt was cultured from the conjunctivae. In 1992 the use of Bt in an Asian gypsy moth control program was associated with classical allergic rhinitis symptoms, exacerbations of asthma, and skin reactions among exposed individuals reporting possible health effects after the spraying operation (2). Unfortunately, there was no followup to determine whether these events were Bt-induced hypersensitivity or toxic reactions or merely due to common aeroallergens coincidental to the season during which the spraying occurred (8). Similar findings occurred during another Bt spraying in the spring of 1994 (8). Allergenicity is of particular concern because approximately 75% of asthma cases are triggered by allergens (9) and morbidity and mortality due to asthma have increased considerably over the past 20 years (10). Although the evidence thus far does not directly implicate human health risks with the use of Bt, it is clear that potential allergenicity of these strains should be evaluated. To accomplish this goal, a surveillance program was conducted in a group of farm workers before and after exposure to Bt pesticides. The investigation included detailed questionnaires to assess symptoms associated with allergic syndromes, nasal/mouth lavages to assess exposure, a ventilatory index of lung function, skin tests to common aeroallergens Address correspondence to I.L. Bernstein, Division of Immunology, 231 Bethesda Ave., Cincinnati, OH 45267-0563 USA. Telephone: (513) 5585795. Fax: (513) 558-3799. E-mail: [email protected] email.uc.edu This paper has been reviewed by the National Health and Environmental Effects Research Laboratory, U.S. EPA, and approved for publication. Approval does not signify that the contents necessarily reflect the views and policies of the agency, nor does mention of trade names or commercial products constitute endorsement or recommendation for use. We thank I. Kosel and J.M. Rancourt (Health Canada) for technical assistance. We appreciate the cooperative efforts of the administrators of Mercy Hospital and the muck farm community of Willard, Ohio. We are especially grateful to the farm workers who participated in this investigation. This study was supported by EPA cooperative agreement #822898. 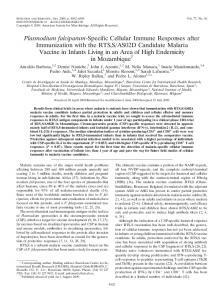 This research was supported by U.S. EPA grant CR822898-01-02 to I.L.B. and the National Biotechnology Strategy Fund (Health Canada and Industry Canada) to V.L.S. Received 4 January 1999; accepted 19 March 1999. Articles * Bernstein et al. and a variety of Bt spore preparations, and the collection of sera for humoral antibody tests to Bt spore and vegetative extracts. Microbial flora from lavages as well as organisms isolated from various sampling activities before and after spray operations were characterized by several methods. Abbreviations: Bt, Bacillus thuringiensis., NA, not applicable; PEFR, peak expiratory flow rate. Abbreviations: Bt, Bacillus thuringiensis, NA, not applicable. aReiative to first exposure. (Boehringer Mannheim, Laval, Quebec, Canada). 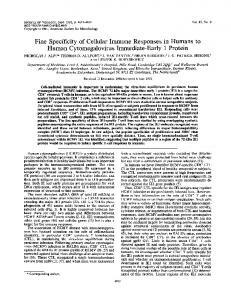 Analysis of PCR products was conducted as previously described (18). Probe stocks were prepared by pooling several reactions of each type of DIG-labeled probe and storing at -20°C until use. Hybridizations were conducted in batches of eight using sterile multiblot trays (8.5 cm x 12.5 cm; Robbins Scientific, Toronto, Canada) according to manufacturer's recommendations, using DIG-labeled probes and membranes (Boehringer Mannheim and Bio-Rad). Photographic prints were taken of each hybridization panel using either black and white (667 Polaroid; Polaroid Corp., Cambridge, MA) or color (400 ASA) film (2). Statistics. The data were analyzed as 2 x 2 contingency tables. Homogeneity and independence questions were addressed by analysis. Changes in responses between X2 visits of group 1 workers were analyzed using McNemar's test. Student's two-tailed t-test was used to compare specific IgE antibody titers before and after varying periods of exposure of group 1 workers. Table 3. Summary of number of symptoms derived from questionnaire data. with skin contact reactions after handling parsley, spinach, or celery; nine workers experienced transient hives unrelated to Bt exposure. 'In all cases, myalgias were associated with musculoskeletal problems caused by physical strains during work. frotal number of group 1 workers prior to first spray exposure. #Total number of group 1 workers who were reevaluated after first spray exposure. 34g 16** 7 2 0 44 5 2 0 0 34 5 4 0 1 Abbreviations: Btk, Bacillus thuringiensis subspecies kurstaki; J-ME-SDS, Javelin (Sandoz Agro, Inc., Des Plaines, IL) mercaptoethanol-sodium dodecyl sulfate; J-PK, Javelin proteinase K spore extracts; J-PROTOX, Javelin-associated pro6-endotoxin; J-WS, Javelin water soluble pesticide extracts. "Protein = 2.5 mg/mL. hProtein = 1.25 mg/mL. CProtein = 0.31 mg/mL. dProtein = 0.69 m/mL. "Visit la workers who returned on visit 2 after first spraying. These workers comprise the high-exposure group.' Une worker not evaluated on visit 1; one worker not evaluated on visit 2. #Two of these workers were not evaluated prior to the first spray. *Significantly different from preexposure visit (p < 0.05). **Significantly different from both low and medium exposure groups (p < 0.051. The longitudinal assessment of group 1 workers compared high exposure (visit 2) and continued high exposure (visit 3) to preexposure (visit 1). The cross-sectional analysis compared high (group 1, visit 2), medium (group 2), and low (group 3) exposure groups. Agreement (correlation) of response between two dependent variables was measured by the K statistic of agreement. Significance was predicated on p < 0.05. Figure 1. Skin test results in group 1 workers. At the baseline visit, 4 of 48 workers showed a positive skin test to at least one of the four Bacillus thuringiensis subspecies kurstaki test extracts. After the initial spraying (visit 2), half of the 32 workers who were reassessed exhibited positive skin tests. Skin test reactivity persisted in 14 of the 20 workers who were tested on all visits. Not included in these data were two workers evaluated during visit 2 but not visit 1; both had positive skin tests. Positive skin tests were also observed in five of seven workers who were tested for the first time in visit 3. One of two workers who were assessed in visits 1 and 3, but not 2, was also skin-test positive. Abbreviations: Bta, Bacillus thuringiensis subspecies aizawar, Btk, Bacillus thuringiensis subspecies kurstakr, IgE, immunoglobulin E; IgG, immunoglobulin G; J-ME-SDS, Javelin (Sandoz Agro., Inc., Des Plaines, IL) mercaptoethanol-sodium dodecyl sulfate; J-WS, Javelin water-soluble pesticide extracts. 'Controls consisted of urban, Bt-nonexposed subjects (14 for IgE results; 28 for IgG results). 1The totals of tested sera vary from the number of workers seen on each visit because some subjects refused phlebotomy and some sera were no longer available at time of testing. cVegetative extracts. dVisit 1 a workers who returned on visit 2 after first spraying. These workers comprise the high exposure group. 'One worker not evaluated on visit 1; one worker not evaluated on visit 2. *Significant as compared to group 1 b prior to exposure (p < 0.05). **Significant as compared to low- and medium-exposure groups (p < 0.05). #Significant as compared to low exposure group (p < 0.05). recovered from these nasal lavage cultures were genetically identical to those found in the commercial spray as well as to a reference ATCC Btk specimen, two other commercial sprays (Agree and Xentari) containing Bta but not the ATCC Bti reference. Cultures from nasal wash specimens of five group 1 workers continued to be positive throughout the remainder of the spraying season. Positive nasal lavage Btk cultures were also observed in eight workers in group 2 and nine workers in group 3. Although specific Bt identification by nasal lavage occurred with a greater frequency in high as compared to low- or mediumexposure groups (p < 0.05), correlations between positive skin tests and/or antibodies were not demonstrated. Table 6. Results of nasal lavage DNA hybridization identifying exposure to Bacillus thuringiensis subspecies kurstaki among worker groups. Exposure No. DNA Mean Visit category tested positive CFU/20 mL Longitudinal study of group 1 la Low 47 3 200 lba Low 31 2 100 2 High 31 21* 532 3 High 22b 6 5 Cross-sectional study of all exposure groups 32 High 22** 540 Low 44 8 23 Medium 34 9 20 CFU, colony-forming units. Figure 3. Verification of Btk in samples recovered from Bacillus thuringiensis spray operations. Abbreviations: ATCC, American Type Cell Collection (Rockville, MD); cry, toxin crystal; Btk, Bacillus thuringiensis subspecies kurstaki, PCR, polymerase chain reaction. (A) Agarose (1.5%) gel electrophoresis analysis of PCR products amplified from control template (50 ng lambda DNA) mixed with Javelin (Sandoz Agro, Inc., Des Plaines, IL; lane b); Javelin alone (lanes d, f, h); or reference Btk product alone (Xentari, Abbott Laboratories, Abbot Park, IL; lanes c, e, g), all diluted to give 104 spores (colony-forming units) final; oligonucleotide primers (20 pM of each) specified lambda (lane b) and the genes encoding cry 1 Ac (lanes c, d), cry 1 Ab (lanes e, f) and 16s ribosomal RNA (lanes g, h). Lane a contains DNA size markers (100 base-pair ladder). (B) and (C) show panels (12 dots per row) of dot-blot DNA hybridizations using a pool of PCR amplified, digoxigenin-labeled, cry 1 Ab and cry 1 Ac gene probes [see (A) and "Methods"]. (B) Rows 1 and 2 show positive results (dots 1-6) for Btk ATCC strains, negative results (dots 7-12) for ATCC strains of Bacillus thuringiensis subspecies israelensis and positive results (row 2) for three products: Agree (Novartis, Greensboro, NC; dots 1-3), Xentari (dots 4-6), Javelin (dots 7-9), and Javelin recovered from spray tank (dots 10-12). (C) Btk detection results of individual bacterial colonies recovered from nasal samples of three workers immediately after their exposure to Javelin spray. In this technique the appearance of weakly staining dots is also considered positive. fermentation media contaminants in the extract of the commercial product, many of the workers who demonstrated positive tests to J-WS also reacted to the J-ME-SDS antigen derived from pure Btk spore cultures. Skin reactivity to the J-PK spore extract was rare (four workers). Only two workers among all three groups demonstrated a positive skin-prick test to J-PROTOX, the Btk spore extract containing the pro-6-endotoxin active component. "Visit 1 a workers who returned on visit 2 after first spraying; these workers comprise the high-exposure group. bNasal lavage of two additional workers tested only during visit 3. *Significandy different from preexposure visit 1 b (p < 0.05). 'Significantly different from low and medium exposure groups (p < 0.05). known previous exposure of these workers to Bta or the presence of cross-reactive epitopes between Btk and Bta vegetative extracts. REFERENCES AND NOTES 1. Cannon RJ. Bacillus thuringiensis use in agriculture: molecular perspective. Biol Rev 71:561-636 (1996). 2. Seligy VL, Beggs RW, Rancourt JM, Tayabali AF. Quantitative bioreduction assays for calibrating spore content and viability of commercial Bacillus thuringiensis insecticides. J Ind Micro Biotech 18:370-378 (1997). 3. Seidler RJ, Watrud LS, George SE. Assessing risks to ecosystems and human health from genetically modified organisms. In: Handbook of Environmental Risk Assessment and Management (Calow P, ed). Oxford:Blackwell Science, 1998;110-146. 4. Pepys J, Hargreave FE, Longbottom JL, Faux JA. Allergic reactions of the lungs to enzymes of Bacillus subtilis. Lancet 1:1181-1184 (1969). 5. Franz T, McMurrain KD, Brooks S, Bernstein IL. Clinical, immunologic and physiologic observations in factory workers exposed to B. subtilis enzyme dust. J Allergy 47:170-180 (1971). 6. 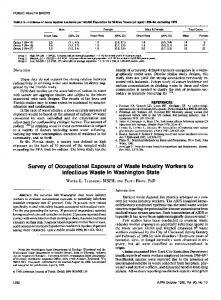 Green M, Heumann M, Sokolom R, Foster LR, Bryan R, Skeels M. Public health implications of the microbial pesticide Bacillus thuringiensis' an epidemiological study, Oregon, 1985-86. Am J Public Health 80:848-852 (1990). 7. Asian Gypsy Moth Control Program, Report of Health Surveillance Activities. Olympia, WA:Washington State Department of Health, 1993. 8. Bender C, Peck S. Health symptoms reported during BTK spraying spring 1994 in the capital regional district. Environ Health Rev (Summer):42-44 (1996). 9. Platts-Mills TAE, Carter MD. Asthma and indoor exposure to allergens. New EngI J Med 336:1382-1384 (1997). (1972). 25. Goodman RM, Hauptli H, Crossway A, Knauf VC. Gene transfer in crop improvement. Science 234:48-54 (1987). 26. Introduction of Recombinant DNA-Engineered Organisms into the Environment: Key Issues. Washington, DC:National Academy Press, 1987. 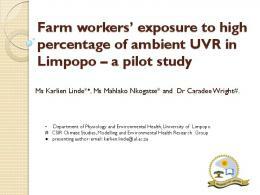 Report "Immune Responses in Farm Workers after Exposure to ... - NCBI - NIH"